Fly Anything! Ultimate Realism, Ultimate Versatility. X-Plane is the world's most comprehensive and powerful flight simulator available. Welcome to the world of props, jets, single- and multi-engine airplanes, as well as gliders, helicopters and new Very Light Jets such as the Cirrus Jet. 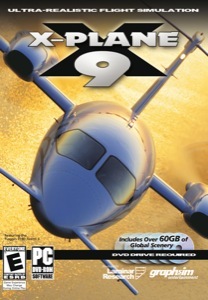 The most realistic flight model available for personal computers. It comes with subsonic and supersonic flight dynamics, simulating aircraft from the Bell 206 Jet-Ranger helicopter and Cessna 172 light plane to the supersonic Concorde and Mach-3 XB-70 Valkyrie. Includes over 40 aircraft spanning the aviation industry (and history), and several hundred more are freely downloadable from the internet. Land at any of over 18,000 airports, as well as test your mettle on aircraft carriers, helipads on building tops, frigates that pitch and roll in the waves.